Attend any state event in Ireland – presidential inaugurations, centenary celebrations or the visit of foreign Heads of State – and one of the bands of the Irish Defence Forces will be there performing music by Irish and international composers based on Irish melodies. 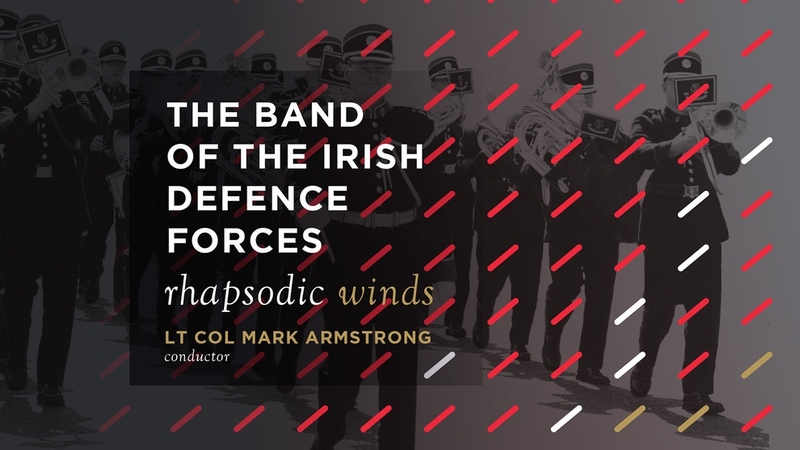 Now for the first time a selection of the most popular and iconic of these compositions is available on Rhapsodic Winds, a new recording of The Band of the Irish Defence Forces from RTÉ lyric fm. Marche tunes obviously play a key role in the Band’s repertoire and none more so than Irish Army March (1923), subtitled General Mulcahy March in honour of the then Chief of Staff of the newly formed Irish Army whose vision it had been to realise a military music school. The German musician Col W. F. Brase was appointed as the first director of the Irish Army School of Music and he arranged this and a number of other works on Rhapsodic Winds, articulating the spirit of the new republic in music. Every track on Rhapsodic Winds is resonant with history. The CD opens with The Boys of Wexford (1963), the well-known 19th century ballad that President John F. Kennedy had heard performed during a visit to his ancestral home in Ireland and, on his return, requested Sammy Nestico, staff arranger of the US Marine Band, to produce a band arrangement. AJ Potter, Hamilton Harty, John F. Larchet and Seán Ó Riada were key figures in the development of the western art-music tradition in Ireland in the 20th century and are all represented on Rhapsodic Winds in their takes on melodies like the rousing Finnegan’s Wake and traditional tunes like The Blackberry Blossom and Roisín Dubh. In addition to fulfilling all ceremonial music requirements for the Irish State and military ceremonial within the Irish Defence Forces, military bands perform a busy schedule of public engagements including annual concert engagements in venues such as the National Concert Hall Dublin, City Hall Cork, and open air recitals in major venues throughout Ireland. Rhapsodic Winds captures the engaging music of The Band of the Irish Defence Forces that makes these public performances so popular and is a must for any CD collection.